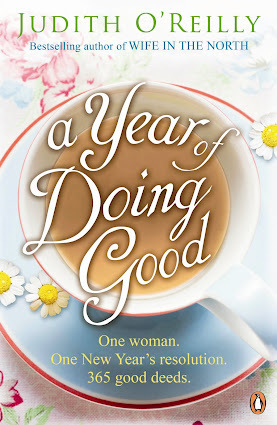 Over the next couple of days, I thought I might run a couple of excerpts from "A Year of Doing Good" here on the blog. The media narrative focussed on my good deeds, in reality the book is as much about what other people do as it is about anything I did during the year. One of the most remarkable "characters" in the book is Jean. I am trying to set my kids a good example, having been set the best of examples by my own parents. I may fail. Epically, as my son would say. Still, epic fail or not, I’ll know I tried. What happens, though, if you don’t learn about charity and generosity from those who should teach it to you as a child? What then? Do you grow up hard and loveless? Or do you teach yourself what goodness is? Jean taught herself. Standing four feet eight and a half inches in her tiny stocking feet, 61-year-old Jean makes you want to pop her in your pocket and take her with you wherever you go, like a lucky charm. After twenty-seven years of working with the terminally ill and those with mental health issues, she retired as a community support worker because of acute osteoporosis and osteoarthritis. Since then, two days a week for a decade, the pupils at my kids’ school have taken it in turns to sit next to Jean as she hears them read. ‘That’s marvellous,’ she says as they stumble through the words. ‘Superb,’ she tells them as they turn the final page. Encouraging children when she was only ever discouraged. Boosting their self-esteem when hers was covered over with ash and beatings. Her arm around these children, when her own mother would never hold her. When Jean fell pregnant at sixteen she was sent to a Church of England home for unmarried mothers and their babies in Blackburn, the girls taken together for antenatal classes but not given pain relief in hospital during the birth of their babies and talked down to by nurses. ‘Inside you were all in the same boat – in a lot of ways it was better than home. Outside, though, they segregated you. You felt awful, you had to walk down the street with your head down, you felt shame – I still do sometimes.’ Her newborn son should have been put up for adoption; instead – ever the protector of the vulnerable – Jean fought for him. ‘I prayed on my hands and knees to my dad to keep him, because you were in that home to give the child away. I thought, I just can’t, and finally my dad said, “If you bring this baby home, you’re not to ask me or your mum for anything because we won’t help,” and by gum they stuck to their word.’ Jean cleaned houses with her baby in tow while bringing up her two youngest siblings, now one and three – siblings who when they left school came to live with her and her husband. I am looking at Jean and thinking, ‘Why are you here doing good? Why aren’t you mean and angry after the start you had in life? When your health broke in your forties, why didn’t you say, “I’ve done enough,” rather than, “What can I do now?” Why don’t you take rather than give?’ I ask her whether it helps her to do good and she says, ‘I’ve seen it – I’ve been there, but you have got to have hope, you have to know that things will get better. I am who I am because of what I have gone through and I can never see me not caring, not doing what I do.’ In nature, where there should be bitter herbs and rank weeds, occasionally a tangle of wild roses bloom: scented, startling pink and beautiful. What an uplifting but also heartbreaking story. I am close to tears after reading Jean's story. Life was tough in the 50s, but for some people it was brutal. Inspiring story. I think some people are simply born good ... and whatever injustices and wrongs are done to them, the power of the goodness endures.